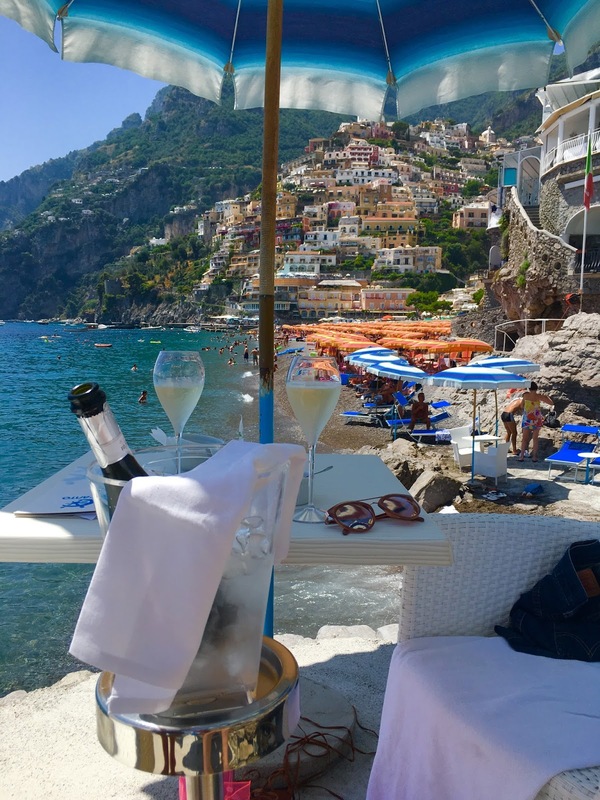 Positano is a magical place. I had high expectations going into Amalfi and they were beyond exceeded. Everywhere you look you are literally saying WOW. 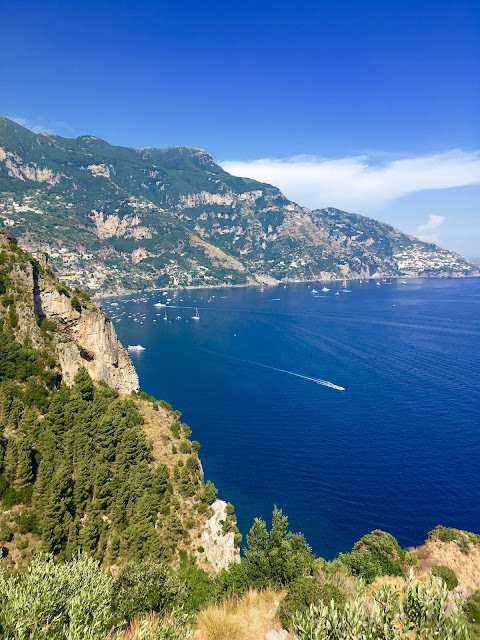 Amalfi Coast is truly unlike anything I've ever seen. Along the coast, is the ever popular Positano town, with rainbow coloured homes perched on cliffs, overlooking the Tyrrhenian Sea. 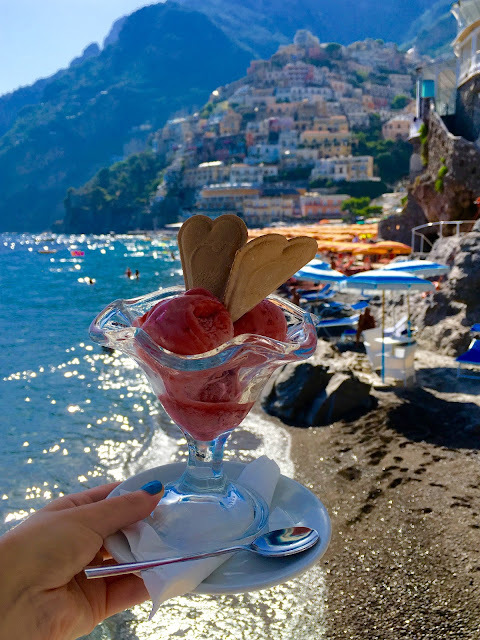 I know many of you have asked questions about Positano, so I thought I would put together a little travel guide. 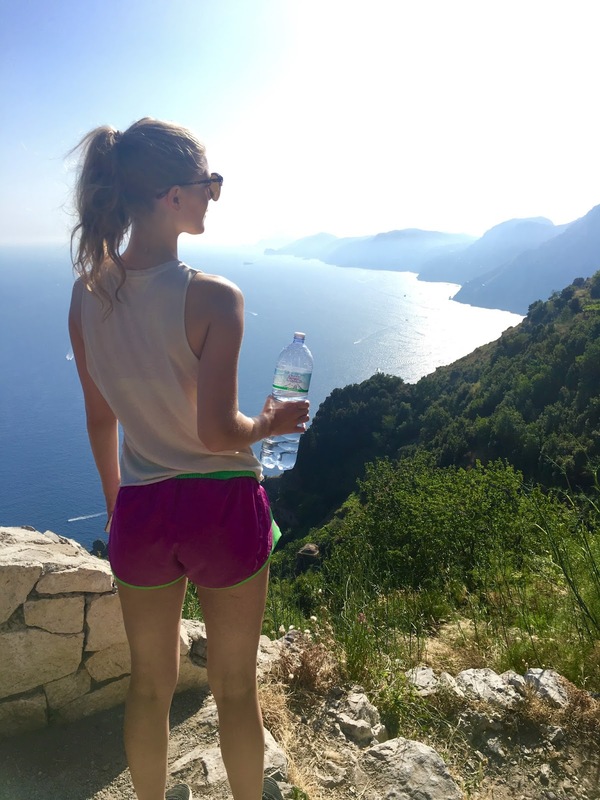 I've listed below some of my favourite places and activities to enjoy in Positano. 1. 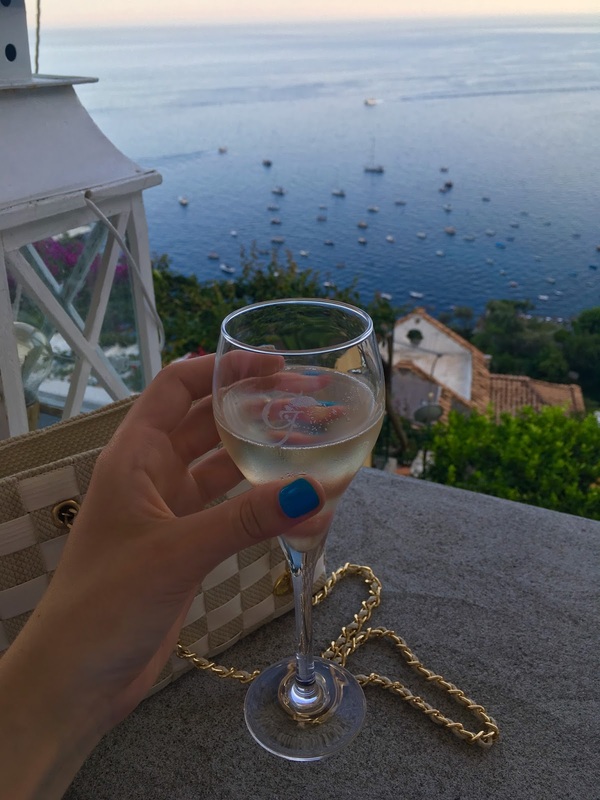 Boating - I highly suggest renting a boat in Positano. It's so ideal to take one out on your own and boat around for an hour. NOTHING beats this view! You can get a little motor boat for about 30 Euros an hour. Theres a little set up right in the middle of the public beach in Positano and its super easy to rent and head out on your own. Such a crazy experience. It was so surreal to throw in an anchor and jump in the warm salt water of the Tyrrhenian Sea. 2. 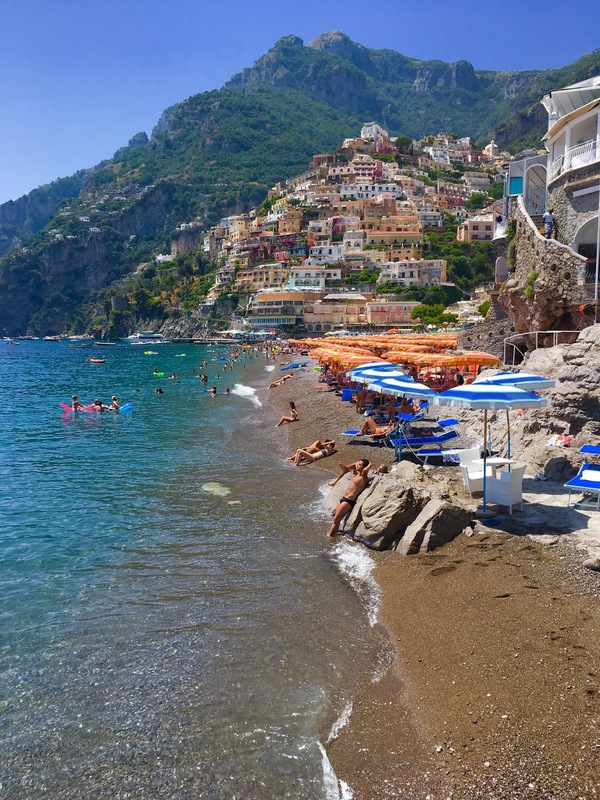 Beach - If you've ever looked up Positano you will see tons of photos of the famous umbrella lined beach. Most people will rent a chair for the day for about 12 Euros. If you know my boyfriend you will know he doesn't do anything basic (which is what I love about him). He somehow spotted this little booth where a man was advertising a private beach just around the corner (past the regular umbrella lined beach). If you walk all the way down the beach, past the orange umbrellas and around a little corner, you will see a small rock cliff with a bunch of blue umbrellas. 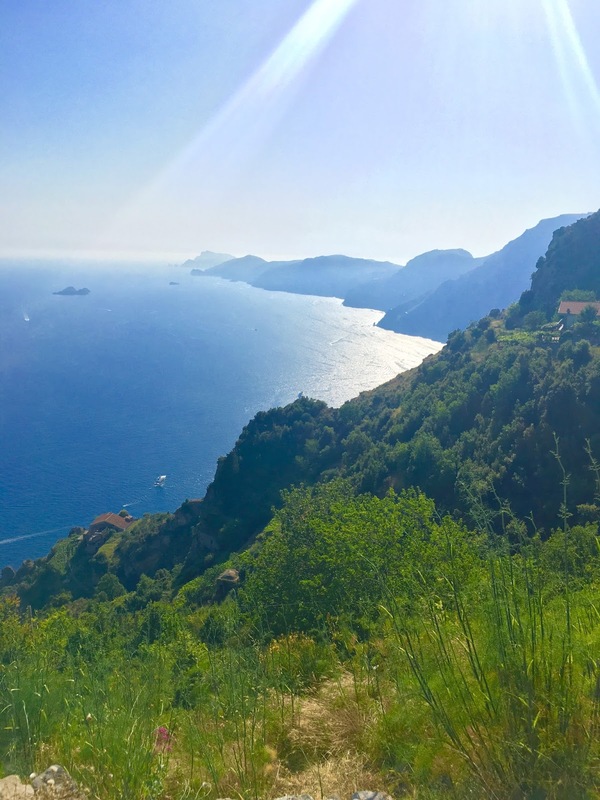 This place was called La Scogliera Positano. What also intrigued us was, it's also a restaurant. You can have food and drinks delivered right to your lounge chairs! However, the kicker with this place is they advertise getting your own chair, towel and water for 20 Euro. When we got there we realized its 20 Euro for a lounger in the back, 35 Euro for a lounger and a table (with umbrella) in the front or 50 Euro for loungers, table and a glass of prosecco if you want to be right on the edge of this cliff rock. Of course I was totally content with the 35 Euro price to be near the railing, however my boyfriend couldn't help himself and had to pick and pay for the very edge location. Let's just say the money was SO worth it. The view was fantastic it actually felt fake. I couldn't stop string out at the view, I didn't want to waste a second. We ended up getting our moneys worth because we spent all day there. 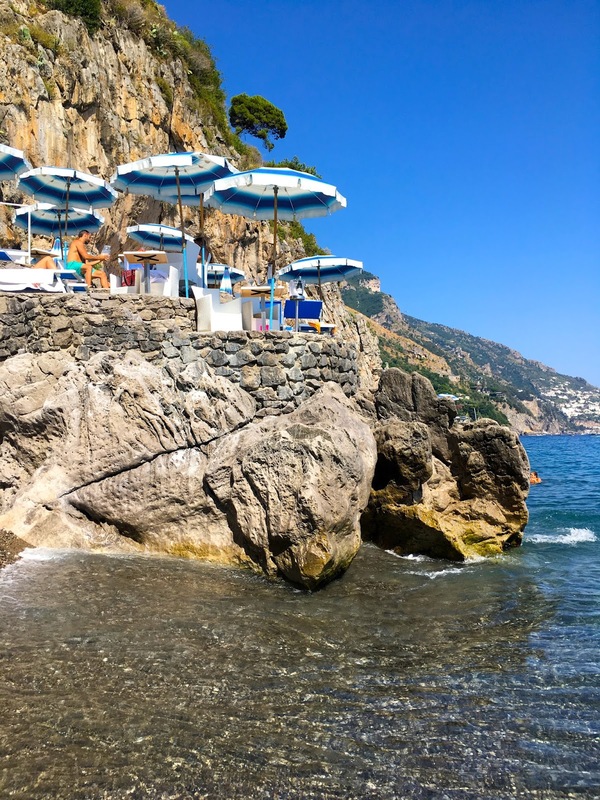 We ordered a bottle of prosecco, paninis for lunch and gelato for dessert and of course swam in the little private beach just below. It was all so surreal. 3. Dinner Da Gabrisa - The first night we arrived in Amalfi was Shawn's birthday, so I made sure to plan and make a reservation for dinner. I had heard great things about Da Gabrisa, so I thought I would try it out. Da Gabrisa was actually just around from the main Positano area, but was equally as beautiful. It's definitely a more quiet area, and that made it more special. The staff was so welcoming and kind and the food was fantastic. The prices were reasonable and we ended up staying for four hours drinking champagne and celebrating. When I made the reservation I mentioned it was Shawn's birthday so we were greeted with a glass of prosecco and a surprise birthday treat for dessert. 4. 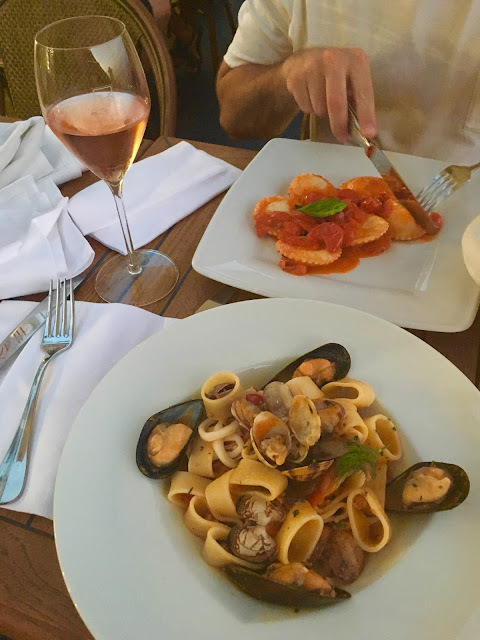 Drinks Le Sirenuse - Le Sirenuse is definitely one of the most upscale restaurants/hotels in Positano. 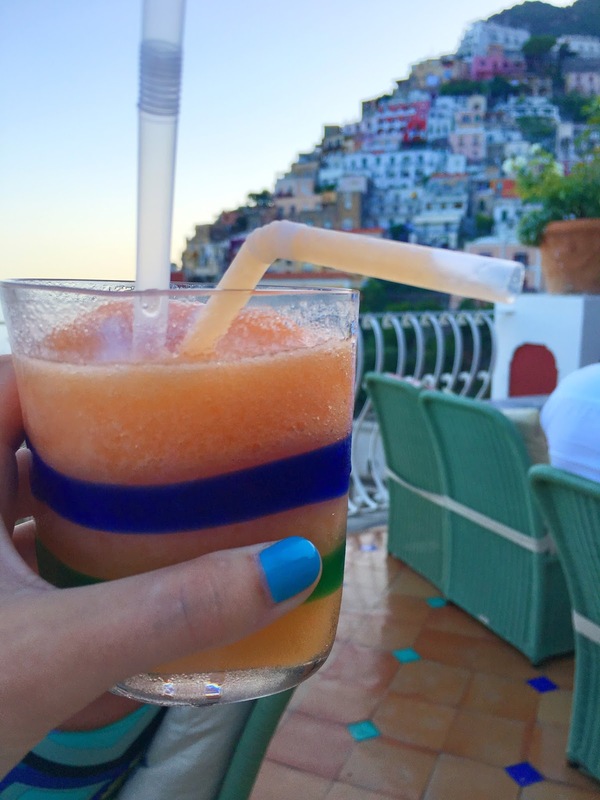 Prices (especially for drinks) are a bit pricer, but with the best views of Positano, its worth it. The drink menu is amazing and I highly recommend grabbing some drinks here before dinner, just make sure to make reservations. It's also a tad fancier then most. Shawn and I made the mistake of going there after sitting in the sun all day, in our beach gear. Shawn got his favourite-an Old Fashioned and I got a fun Bellini style drink. Shawn said it was probably one of the best drinks he's had. 5. 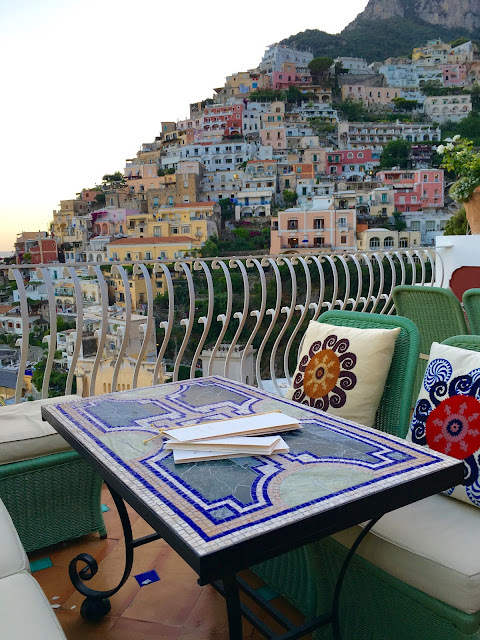 Hotel Grand Hotel Il Saraceno - We ended up staying about 30 minutes from Positano. 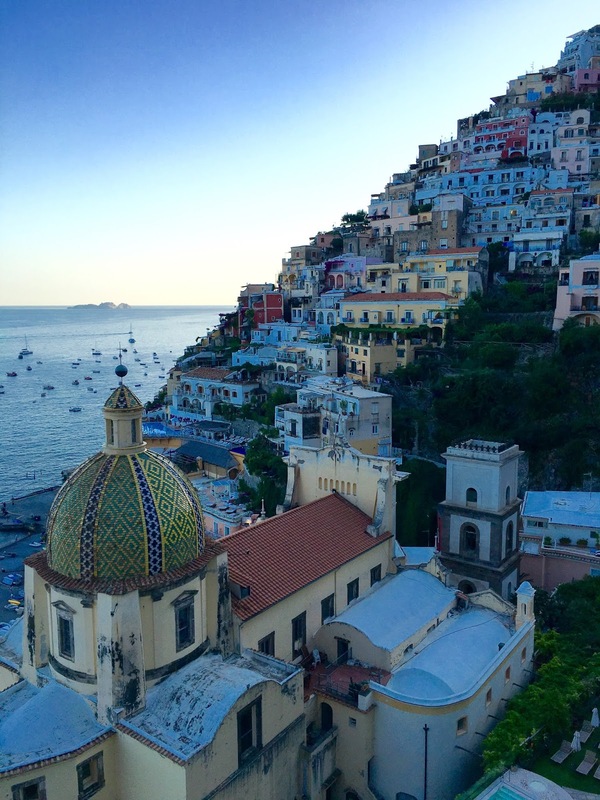 We were actually closer to the town of Amalfi then Positano, but regardless of location our hotel was so cool!! I felt like I was in Game of Thrones. It was this magical looking castle built into a cliff. Walking down to the beach was a trek, but so worth it. The only thing I would change if I had to do it again is make sure the hotel was a little closer to Positano. We must have read it wrong, but we thought our hotel supplied us with a free shuttle to Positano and back. 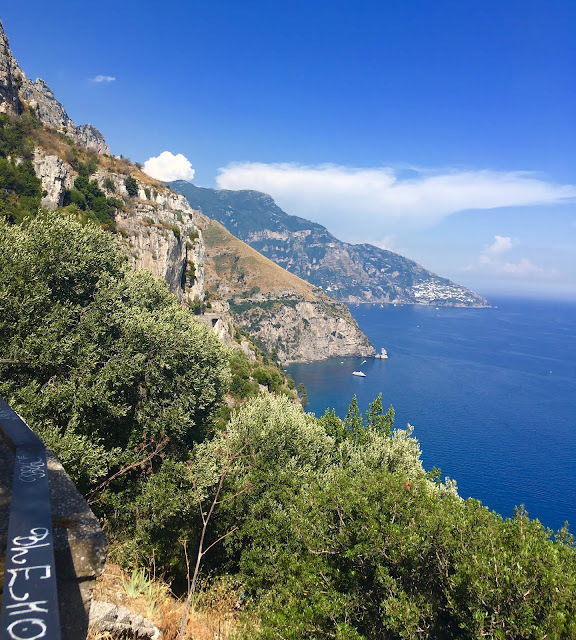 However, the shuttle they had was to Amalfi, not Positano. We did have a rental car, but if we were planning on drinking we had to take the crazy public bus. It would take about 30-40 minutes sometimes and was always packed! The bus times are sometimes all over the place, so one night the bus never came so we had to pay 75 Euro for a taxi back to our hotel...and that hurt! 6. Driving along the Amalfi Coast - We decided to rent a car and drive from Rome to Amalfi. 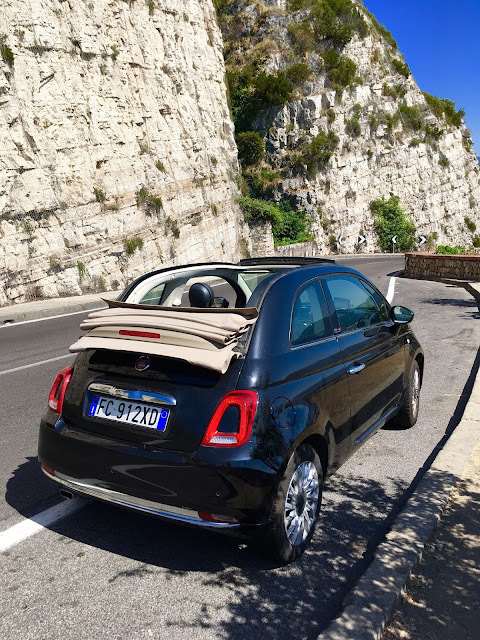 We ended up getting the cutest convertible Fiat and it was so much fun driving along the crazy roads of Amalfi. The roads are so tiny, and everyone drives so fast I had to get use to it. Experiencing the drive on our own along the coast was again, just breathtaking. We had permanent smiles on our face as we turned every bend. Just when we thought we couldn't see anything more beautiful, we would round another corner to see even more!! 7. Path of the Gods Hike - We had heard amazing things about this Path of the Gods hike that leads you right above Positano. We decided to set out and find our way to the start of the path. I will admit, its quite hard to find the actual path, but we used this link to find our way (here). We also were lucky to have a rental car because it made our travel to this little town where the path starts, a lot less stressful. Although we only made it half way along the path, it was so beautiful! However, I think I had more fun laughing at my boyfriend the whole time because I found out just how afraid he is of heights. Worth the views and worth the embarrassing videos I got of Shawn freaking out. Feel free to message me if you have anymore questions, but I hope this information helps. 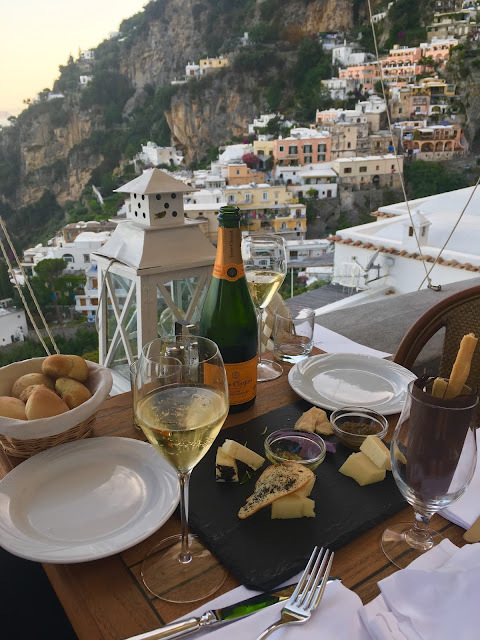 Like I said...I highly recommend Amalfi Coast and Positano! !